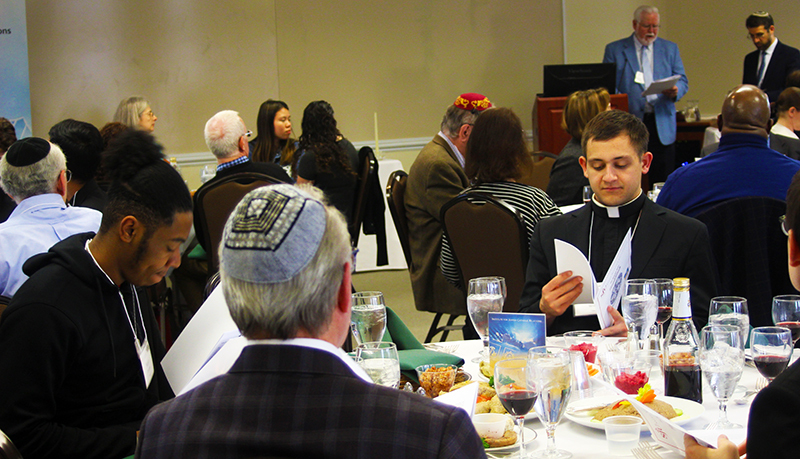 More than 100 area Catholics, Christians and Jews joined to celebrate the common origins of their respective faiths at an April 7 Passover seder hosted by St. Joseph’s University. The gathering was organized by the school’s Institute for Jewish-Catholic Relations (IJCR). Founded in 1967, the IJCR is the oldest university center of its kind in the U.S. created in response to the Second Vatican Council’s call for increased interfaith dialogue. Additional sponsors of the seder included the Jewish Community Relations Council of the Jewish Federation of Greater Philadelphia, Main Line Reform Temple Beth Elohim and the American Jewish Committee. The seder (which means “order” in Hebrew) is “the experiential, educational lesson par excellence of Jewish tradition,” said Rabbi David Straus, senior rabbi of Main Line Reform Temple. 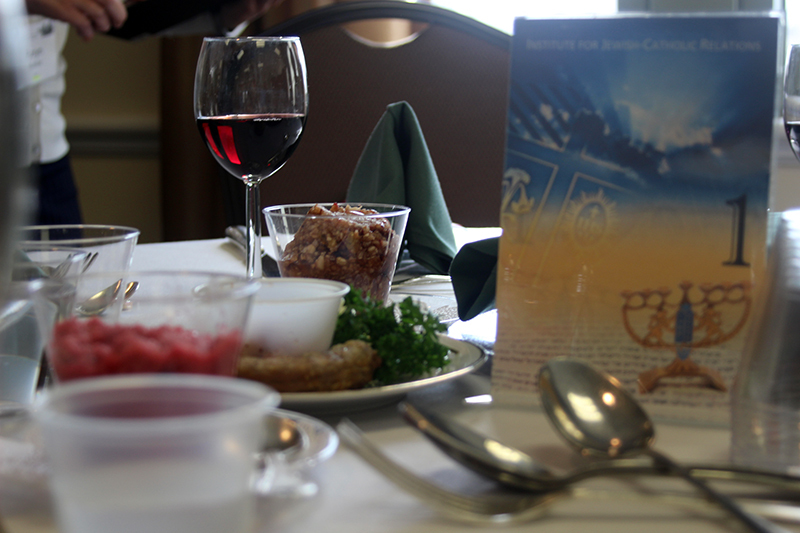 He joined IJCR member Rabbi Abraham Skorka in presiding over the ritual meal, which commemorates the divine liberation of the ancient Israelites from enslavement in Egypt, as recounted in the book of Exodus. Rabbi Straus noted that the origins of the shared meal “probably go all the way back” to the actual Exodus from Egypt. While scholars cannot be certain if it was an actual seder, the Last Supper, which is memorialized in the Mass, “was clearly some kind of shared meal as well,” he said. The April 7 seder, like most, followed a traditional order of the ritual as set down by Jewish rabbis in the fifth and sixth centuries. Through symbolic foods, wine, Scriptural passages, prayers and songs, the events of the Israelites’ captivity and deliverance were recalled. Both Jewish and Catholic faith traditions have corresponding concepts in this regard: the Catholic understanding of anamnesis, through which Christ’s passion, resurrection and ascension are memorialized at Mass; and the Hebrew zecher, or call to remember. In addition to matzah (unleavened bread), seder meals feature foods that invoke key aspects of the Exodus experience: parsley or a leafy vegetable (karpas) for the rebirth of spring, salt water for the tears shed in captivity, bitter herbs (maror) such as horseradish for the suffering endured as slaves, shank bone (z’roah) for the ancient Passover sacrifices in the Temple periods, roasted egg (beitzah) as a symbol of creation and charoset, a sweet mixture of apples, nuts and wine that recalls the bricks which the ancient Israelites were forced to make in Egypt. Participants drink four cups of wine throughout the seder in honor of God’s redemptive promises, and one cup is set aside in honor of the prophet Elijah, who according to Jewish belief will appear on a Passover eve to herald the messiah’s arrival. In recent decades, many Jews have introduced a cup of water in honor of Miriam, the sister of Moses and Aaron, who played a critical role in the Exodus narrative. Miriam’s cup is an example of the dynamic nature of the seder, said IJCR co-director Adam Gregerman, professor of Jewish studies at St. Joseph’s University. The IJCR seder adopted a contemporary theme of welcoming immigrants, as part of the Jewish Community Relations Council’s commitment to social justice. Both Catholics and Jews experienced religious and ethnic prejudice upon their arrival in the United States. The theme was particularly relevant to IJCR director Philip Cunningham, professor of theology at St. Joseph’s University, whose father immigrated from Ireland to the U.S. in 1929. Cunningham noted that “chain migration,” which has become a pejorative term for family-based movements from one country to another, is actually a natural dynamic that highlights the deep social and communal bonds evident in the seder. The seder itself is normally celebrated in the home with family and friends, rather than in a public location or in a synagogue. Nevertheless, organizers stressed the benefits of the interfaith seder, which took place several days in advance of the first night of this year’s April 19 Passover celebration. Msgr. Gregory Fairbanks, professor of church history of St. Charles Borromeo Seminary in Wynnewood, brought 11 seminarians to the gathering so that his students could “experience the common roots of our faith with Judaism,” a practice encouraged since the Second Vatican Council. “We also want them to recognize the integrity of the Jewish faith and their traditions, and to grow together in friendship, love and respect,” he said. Philadelphia area residents Robert Gidding and Anna Marie Viscarra, an interfaith couple, appreciated the opportunity to celebrate their respective Jewish and Catholic heritages in a common setting.